Recently, all sorts of inventive garden accoutrements have come out with the purpose of incorporating foliage into the vertical hardscape. Those fabric “pockets” that act as living awnings are probably the most familiar. But this design – on the wall at Folsom Street’s Stable Café, and built by Lila B. – wins the prize for the most artistic, practical, and recycled. The salvaged, multi-colored shutters now no longer serve to let in or block out the light, only to support succulents. These plants are famously drought-tolerant and low maintenance, perfect for rooting down in narrow spaces. 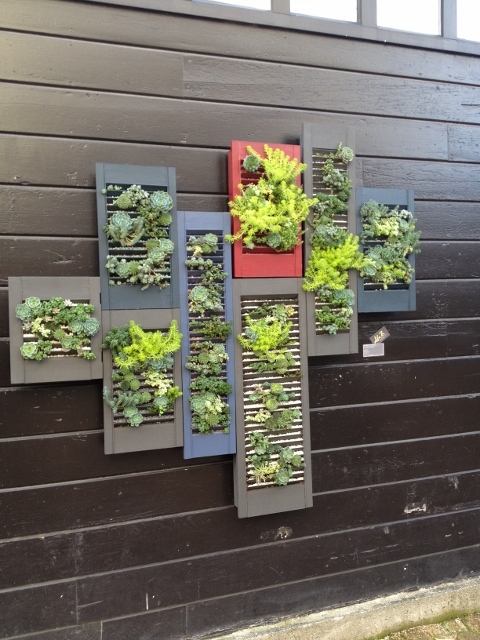 Between the repurposed window covers and hardy hanging-on succulents, this installation is a testament to survival.